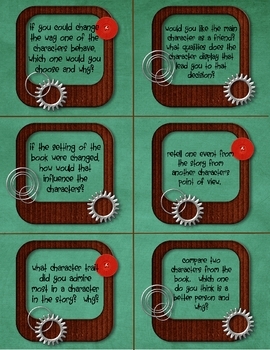 This product made by Laura Stegmann is a series of cards with comprehension questions programmed on them relating to the characters found in a novel. These cards can be printed by the user and then cut apart and bound or put onto a metal ring. 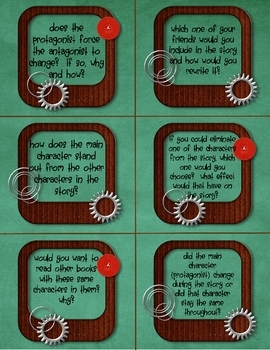 The questions on these cards can be used for guided reading groups, literature discussion groups, or for a students' independent reading in a balanced literacy setting. 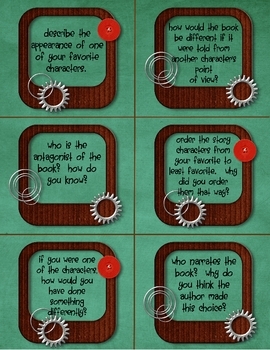 The questions on these cards range from very basic questions to higher order thinking questions which elicit more thought from your readers. 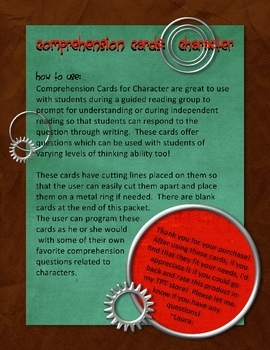 A set of blank cards have been included in this set so the user can pre-program additional cards to his or her liking based on some of their favorite questions related to character.